The Airbus Helicopters AS365 n3+ Dauphin is a multirole, medium weight helicopter that is part of the larger Dauphin family of aircraft. The Dauphin was originally known as the Aérospatiale SA 365 Dauphin 2 and then as the Eurocopter AS365 Dauphin, as it was manufactured by each company in turn before being acquired by Airbus Helicopters. The first Dauphin took flight in 1975 and the AS365 n3+ represents decades of updating and refinement in response to changing demands and technologies. The Dauphin fill several important niches in the helicopter market. It is a popular choice for corporate transport and has found a home as an airborne law enforcement platform. The Dauphin has also found favour as a medical aircraft, news helicopter and with search and rescue units. The n3+ Dauphin uses a twin-engine design and is known for its exceptional range. This helicopter is capable of “hot and high” operation, making it ideal for search and rescue in harsh conditions. The n3+ model is differentiated by its more powerful Turbomeca Arriel 2N engines that have a 15% power advantage over previous Dauphins. The n3+ Dauphin can take if in ground effect at maximum takeoff weight at temperatures of up to 50 degrees Celsius. As a transport the Dauphin is capable of carrying twelve people and two pilots, but there is also a more luxurious VIP configuration that caps that number at seven passengers. The n3+ Dauphin is especially suited for transport in urban areas thanks to the Airbus Fenestron tail rotor system and Starflex low-noise rotor head. Excessive noise and accidental damage or injury from exposed tail rotors in urban confines are two key considerations for city bound helicopters. The civilian use case for the Dauphin is further bolstered by its low operating costs and relatively easy flight operation. The Dauphin has dual controls, but can easily be flown by a single pilot under instrument flight rules thanks to sophisticated avionics and a 4-axis autopilot. By 2011 one thousand Dauphins had been delivered for civilian use in over 60 countries. They are in use by over 300 operators globally. Dauphins are delivered at a rate of 30 to 40 per year. Cumulatively the Dauphin account for about 4.6 million flight hours. Each Dauphin costs slightly less than 10 million USD or 7.5 million Euros. 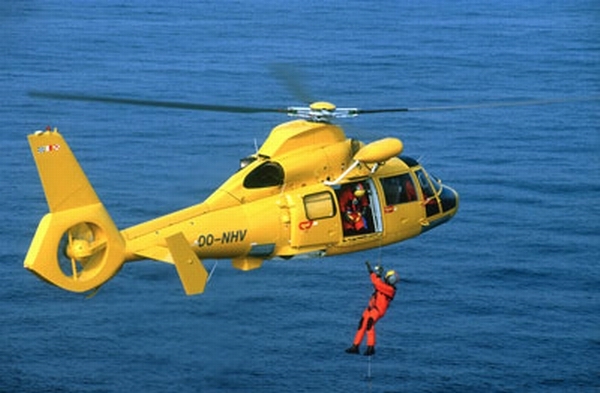 A successor has been named for the Dauphin, known as the H160.However, as of March 2015 it has yet to enter service. Arrival of a Dauphin AS365 SAR helicopter at the 'Reddingsbootdag' in Katwijk, The Netherlands. Do you want to comment the Eurocopter AS365 n3+ Dauphin helicopter?